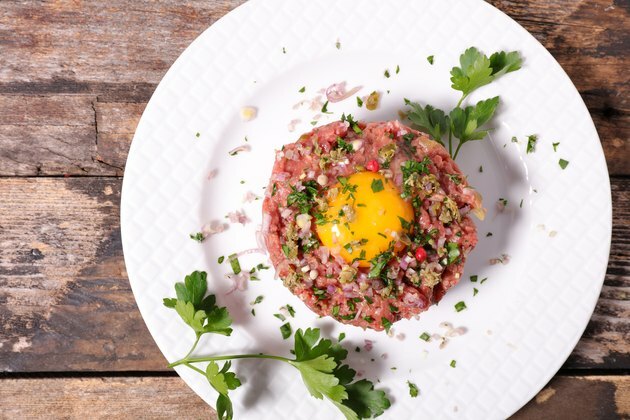 While meat-loving foodies may swoon for steak tartare or yukhoe, eating raw beef dishes like these or even rare cooked beef can potentially make you very sick. Food poisoning can occur if the raw or undercooked beef is contaminated with a disease-causing organism. Cooking beef steaks or roasts to an internal temperature of 145 F followed by resting the meat for 3 minutes before eating kills most of these germs. Ground beef must be cooked to an internal temperature of 160 F.
Eating raw beef poses potentially serious health risks, particularly for young children, pregnant women, seniors and people with a chronic illness or weakened immune system -- such as those with HIV/AIDS or being treated for cancer, and organ transplant recipients. However, even otherwise healthy people can become severely ill from food poisoning. While most people recover from food poisoning, the Centers for Disease Control and Prevention estimates that approximately 2,600 Americans die of foodborne illnesses each year. What Happens If You Eat Bad Ground Beef?